At the Coral KidZ Club, our youngest guests can discover a whole new level of fun with the most advanced technology. 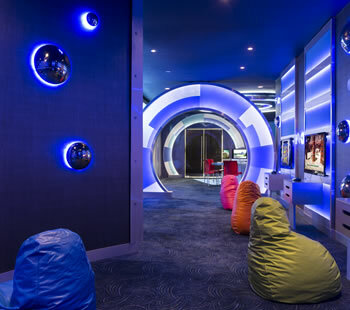 This 4,000 square meter area, designed by the renowned Canadian firm Launch by Design Inc., offers 40 activities that stimulate imagination and learning inside and outside the club. Children 3-5 years old can choose their own environment: city, park or forest. Preteens and teens will find the latest video games to play, plus arts and crafts, theater, dance and a full dressing room with wardrobe and makeup. For outdoor activities, there¿s basketball, a remote control track, Mexican traditional floor games and the innovative NEOS, the first electronic system in the world that combines speed and the fun of video games with the animated movement of aerobic exercise. Take your children to Coral KidZ Club, one of the best children's clubs in Latin America.